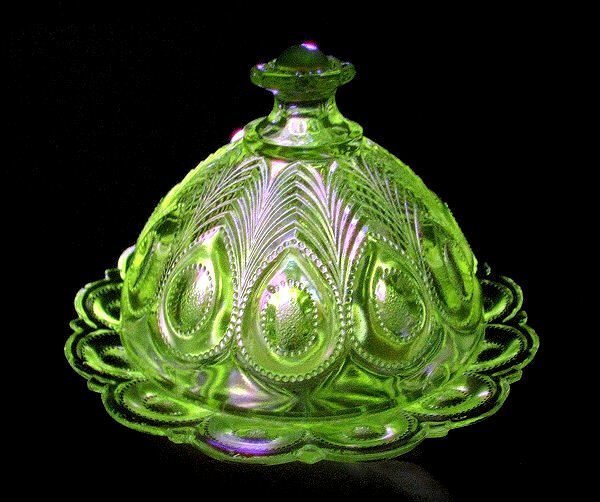 Late 1800’s Richards and Hartley Peacock Feather Covered Sugar Bowl shown blacklighted, causing the uranium oxide content to glow a beautiful green. I picked this rare and valuable piece in a thrift store three days before Christmas for $5.99. Sometimes I have the best luck. Maybe I just create it by being persistent. And maybe sometimes, I really don’t know. The older I get, the more I realize you create your own reality. 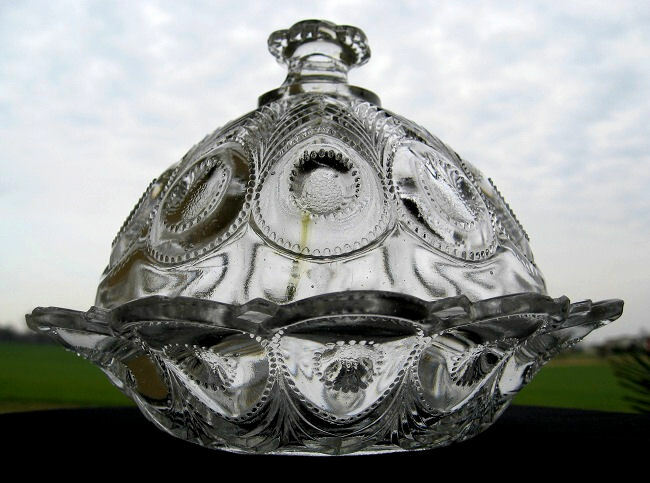 I had just featured an 1820’s Boston & Sandwich Peacock Feather bowl on my Antiques & Early Glass page last week, mentioning in the description there exists an 1890’s to 1900’s later version, all the while thinking how great it could be if I had an example of that more recent version to show for comparison. I’ve had them in the past, but then I was in the business to make a living and they usually got sold. Now I don’t have that problem. I pick for the thrill of discovery and keep the treasures. Remember when you were a kid, and you had a band aid or cigar box full of all your treasures? Maybe there was an arrowhead, or a fossil shark tooth, or a beautiful piece of beach glass. Well, now I’ve gone and expanded that box to a livable size. These’s no place like history either. Never sell what you love. 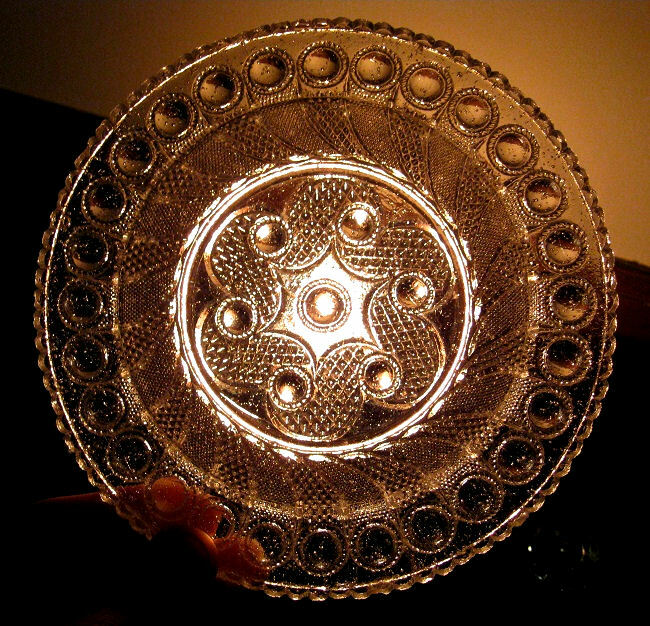 The above 1820’s Boston & Sandwich Glass Company Peacock Feather flint glass 6″ bowl is a favorite of mine. 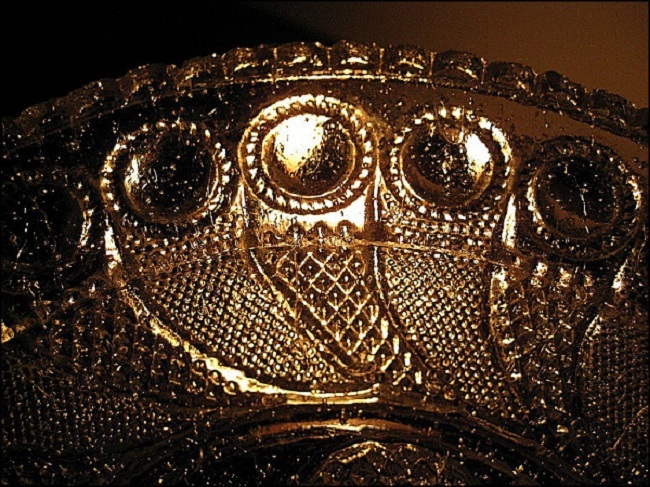 It’s a very intricate and beautiful pattern. This busy pattern is referred to as ‘Lacy,’ style and was made from the 1820’s to right around the 1840’s, after which, less busy and more prominent patterns began appearing. 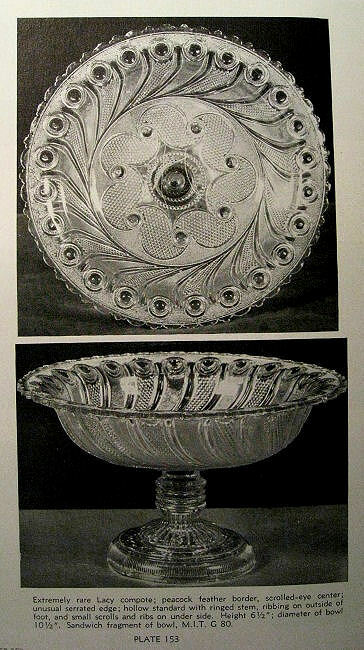 This 1820’s early pattern is featured as an extremely rare compote, identical to my bowl, in plate 153 in the book American Glass by George S. and Helen McKearin. The only other version of the Peacock Feather pattern is attributed to a glass company named Richards and Hartley who began in Pittsburgh, Pennsylvania, in 1866. They later consolidated with many other glass companies in the midwest area to form the US Glass Company in 1891. 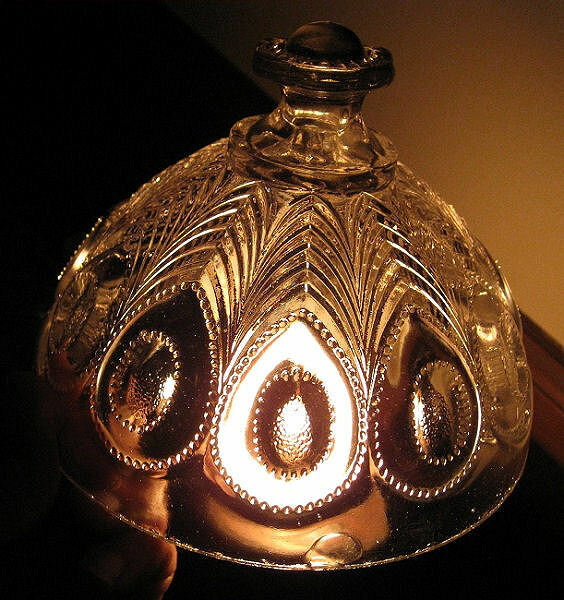 This pattern later became pattern number 15076, also named ‘Georgia,’ as the US Glass Company named patterns after states. There’s nobody I know who calls it anything but Peacock Feather. The much earlier 1820’s Boston and Sandwich bowl is very heavy. Primitively pressed flint glass, it’s very high in lead content. The Richards and Hartley 1890’s Peacock Feather is not lead flint, but a more basic silica, soda, and lime mix; lighter in weight, with just one similar addition to the mix as the older example. 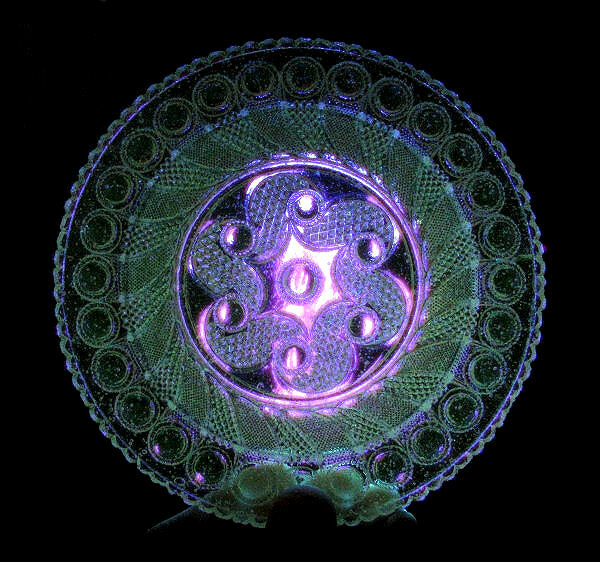 Most folks, (even collectors) don’t know that a lot of old, clear, glass glows green under a black light. This is caused by the uranium oxide content in the glass. Dangerous for use? Probably not life threatening, but you’re better off now with current glass technology. 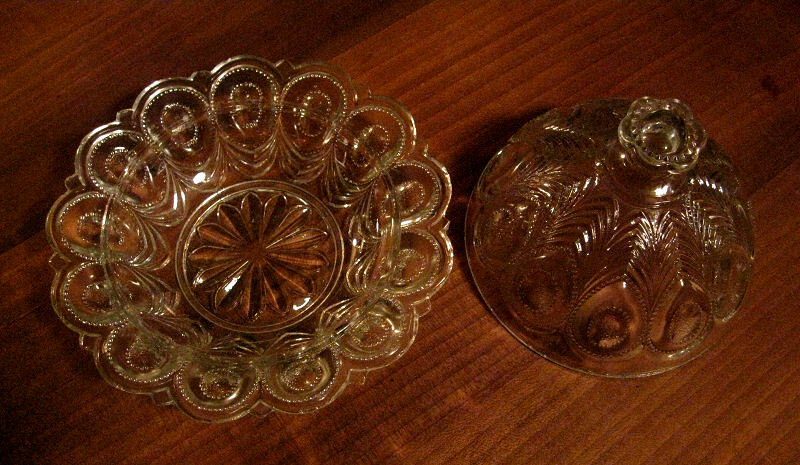 I remember selling a very rare yellow decanter, and other pieces, to a most prominent private collector of Boston & Sandwich glass, and her mentioning that her Grandmother had an entire set of the 1890’s patterned Peacock Feather for her dinner service and considered it the prettiest of all early glass patterns. You’ll find no arguments here. I see early glass patterns all the time and this one, rarely seen, stands out in a big way. It certainly stood out in a big way when I saw it on a bottom shelf at Salvation Army right at the tips of my shoes on the Saturday before Christmas for only $5.99 in the nicest condition you could ask for; just begging for Salvation. Of course I rescued it. My holiday shopping was already done. While everyone headed for the ‘Mall,’ I ran screaming in the opposite direction, heading for a little real Salvation of my own. I love pickin,’ especially a nice present for myself. This is a big (6″ high x 7″ wide) candy, or sugar, covered dish. (Sugar came in chunks in those days.) It has an unsual streak of green in the glass and lots of bubbles and is easily worth 20 times what I paid. The older 1820’s version below is much more primitive, some 185 years old. Both of these pieces were made in a very primitive fashion. Old glass has taught me that the more primitive, the closer to hand making, the closer to true art we come, just as any sculptor or painter. These weren’t just glassworkers, from the moldmaker to the blower or pressman, these were artists. One is remarkably older, dating to the 1820’s. The newer version is closer to the turn of the century, well over 100 years old. Two old peacocks still struttin’ their feathers.